Buddhism came to Tamil Nadu during the 3rd century BC and it prevailed in the Chola country up to the 16th century AD, which is vouchsafed by an inscription found in Kumbakonam. Buddha viharas were found in many places including Poompuhar and Nagapattinam. The remnant of a vihara is still intact in Poompuhar. Sixty-four Buddha statues were identified in the Chola country comprising of Thanjavur, Nagapattinam, Tiruvarur, Pudukottai, Trichy, Karur, Perambalur and Ariyalur districts during field study undertaken by the author since 1993. Among these 60 statues were in seated posture, and the rest from Cholanmaaligai, Poompuhar, Thiruvalanchuzhi and Sundarapandianpattinam were in standing posture. 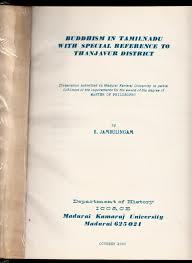 According to earlier researchers Buddha statues were found at Alangudipatti, Ayyampet, Chettipatti, Kottappadi, Kurumbur, Manganallur, Valikandapuram and Vellanur of Pudukottai. However when the author surveyed these places they could not be located. Probably these statues were lost forever. This highlights the need that these statues have to be protected and preserved by the Government. Several Buddha images are displayed in museums. In the study area Buddha statues are found in Siva temples, village deity temples and Jain temple. Some of them are found in the centre of the town, paddy fields, outskirts of the town or even in the neglected areas. This paper deals with the Buddha statues distributed in and around non-Buddhist temples in the Chola country. Buddha statues are found in five Siva temples. They are Ekambaresvarar Kamatchiamman temple (Sundarapandianpattinam), Mathyarjunesvara temple (Pettaivaitthalai), Parsvanathaswami temple (Muzhiaiyur, near Pattisvaram), Sempakaranyesvarar temple (Thirunagesvaram near Kumbakonam) and Siva temple (Thiruvalanchuzhi). There is an inscription in Kumbeswarar temple at Kumbakonam, which speaks about the presence of a Buddha temple in Tiruvilanthurai. During field study a Buddha statue was found in the Ekambadresvarar Kamatchiamman temple in Sundarapandianpattinam during September 1999. 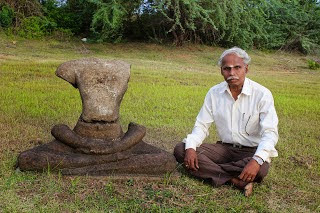 Dr J. Raja Mohamad who identified this Buddha says, “A rare Buddha statue in standing posture has been discovered at Ekambaresvarar Kamatchiamman temple at Sundarapandianpattinam, a coastal hamlet on the border of Pudukottai and Ramanathapuram districts. It is believed that the statue was brought from a ruined, nearly mandapa a structure which bears a resemblance to a Buddhist monastery. The stone idol is similar to the ones found at Nalanda in Bihar, the great Buddhist centre. The Buddha wears a close fitting robe extending from the neck to the legs, in addition to a sangati, covering the back, whose end has elegant folds. The face is oval with the nose, lips, chin and eyes exquisitely chiseled. The earlobe is long, the forehead has a tilak and on the right palm is a diamond-shaped mark-features considered Mahapurushalakshana in Buddhist mythology. The hair on the head is studded knot surmounted with a tapering flame called usnisha indicating the supreme knowledge” (The Hindu: 23.11.2002). This statue is not worshipped now. But it is placed near the sanctum sanctorum of the main deity of the temple. This statue resembles the style of Nagapattinam Buddha bronze. A Buddha statue, which was found during fieldwork in September 1998 near the rajagopura of the Mathyarjunesvara temple at Pettaivaithalai is now exhibited in the Government Museum, Trichy. This Siva Temple, constructed by Kulothunga III is on the Trichy-Karur road, about 20 km from Trichy. The statue is in padmasana dhyana posture. Local people call this Buddha as ‘Samanar’ which actually refers to a Jain Tirthangara. According to them originally there were three Buddha statues and two of them are lost. 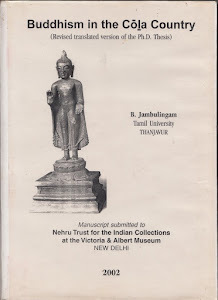 The only statue, which was found near Mathyarjunesvara temple, has been shifted and exhibited in the Government Museum at Trichy in May 2002 (Dinamalar: 17.5.2002). At the Parsvanathaswami temple in Muzhaiyur, near Pattisvaram, in Kumbakonam taluk a head of Buddha statue was found during field study in June 1999. One of the ears of this Buddha , whose face has a gracious smile, is found broken. Curled hair and usnisha are perfectly carved. This is not under worship. Two Buddha images were found in the prakara of the Amman shrine of the Sempakaranyesvarar temple at Thirunagesvaram near Kumbakonam in Thanjavur district during field work. These images are in sitting posture and they are not under worship. Even though the workmanship of these statues is not so good, the presence of these statues confirms the existence of Buddhism in this area. Very near to this place is an area called ‘Channapuram’ (Jainapuram). Based on this place name and the similarities of the Buddha statues with the Jain images it can be suggested that this place might have been a Jain centre. There was a Buddha statue in the Siva Temple of Thiruvalanchuzhi in Thanjavur District (1957: 103). “The prominent but delicately carved features the exceedingly proportionate modelling and the tastefully worked drapery made this figure as one of the masterpieces of sculpture belonging to the end of the early Chola period. A noteworthy detail of this figure is its urna, which is shown not as the usual prominent circular dot on the forehead but simply outlined as an inverted question mark in the fashion of a number of bronze images from Nagapattinam. The urna and other details show the close correspondence between a metal image and a stone figure of the same period and locality. It also does not have a halo. In general, the features of the figure show that the sculptor who produced this was still imbued with the artistic tradition of earlier periods” (1960: 94). This statue is now exhibited in the Government Museum, Chennai. (On) the 22nd day of the month of Adi in the year Vikrama, all the people of Tirumalairajapuram assigned 2¾ (veli of) land in the Brahman village (agaram) of Tirumalairajapuram for repairs as a charity of Sevappa Nayakkar-ayyan as the channel was dug and passed through the land belonging to ‘Titta Mamarunda-Nayar of the Buddha Temple’ at Tiruvilandurai. From the above inscription it is understood that for digging the canal at the land belonging to the Buddha temple of Titta Mamarunda Nayar, compensation was made. From it one can infer about the presence of Buddha temple around 16th century A.D. Even though there are no remains of the Buddha temple at Tiruvilanthurai now, this inscription confirms the existence of Buddhism till that period. It is the only inscription from a Siva temple in the Chola country that speaks about a Buddha temple. Buddha statues are found in the village deity temples such as Aravandi Amman temple (Mangalam, near Musiri), Muthumariamman temple (Pattisvaram, Thanjavur district) and Nilavalamudaya Ayyanar temple (Karur near Ponpatri). In Mangalam of Tiruchy district, 15 km from Musiri, there is an Aravandi Amman temple. 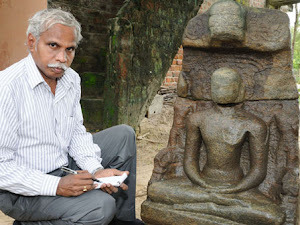 The author with the help of K.Sridharan identified a Buddha statue in the temple in May 1998. According to K.Sridharan, “The locals have been worshipping the statue of Buddha along with the deity Aravandi Amman. The bottom portion of the peetam of the statue has three lions in sitting posture. The statue is in padmasana dhyana posture and the face, the broad shoulders, the long arms and the palms one resting on the other is an example of the high degree of workmanship achieved during the Chola period. The face exemplifies the blessed state of the mind during dhyana, and the long earlobes, the typical head gear, and the hair arranged in a bunch at the top portion, give a special grandeur thanks to the backdrop of granite tiruvasi like constructions at the rear. This statue belongs to 10th century” (The Hindu: 8.5.1998). The special feature of this statue is the presence of moustache (Dina Malar: 17.6.1999). Nowhere in the Chola country Buddha statue with moustache is found. It is to be noted that no other Buddha statue of this area has lions on the seat. According to the villagers since Buddha was against sacrifice, they constructed a separate shrine there away from the folk deity. They call the Buddha image as 'Chettiar’. Near Pattisvaram on the Pattisvaram-Govindakkudi road is a temple dedicated to Muthumariamman is found. A Buddha statue was found during field study in October 1998 in this temple. The Buddha image in seated posture is installed along with other folk deities (1957: 45).Even though the local people do not know that the image represents the Buddha, they offer worship. This is one of the smallest Buddha statues found in the Chola country. A Buddha image is found during the fieldwork undertaken in September 1999 at Nilavalamudaya Ayyanar temple in Karur, which is five miles to west of Ponpatri in Arantangi Taluk in Pudukottai district. From the iconographical aspects it appears to belong to the Chola period (1992: 249). This is a small but beautiful figure seated in the usual dhyana posture. “It has around it, the prabha on pillars. The other features of it are unmistakably in the late Chola period. 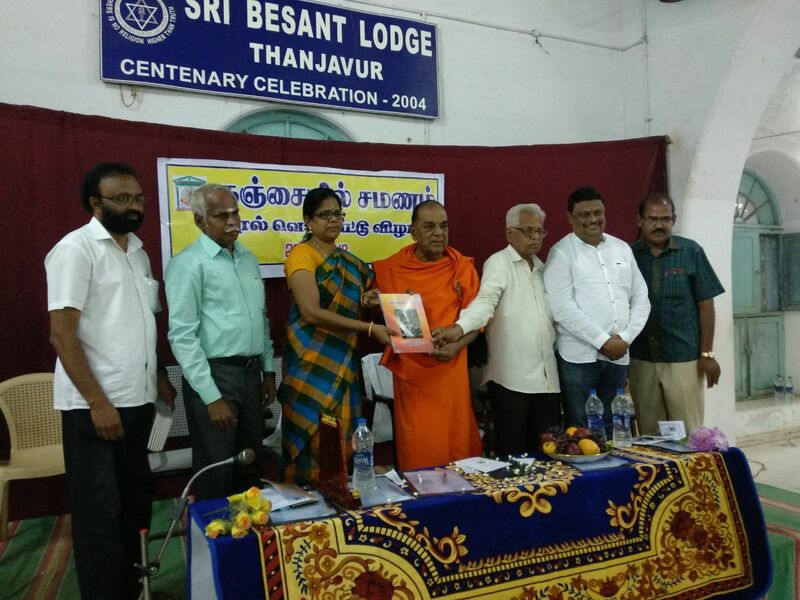 It must be noted that Karur is very near to Ponpatri, the birthplace of the famous Buddhamitra who lived in the 11th century A.D. He wrote Veerasoliyam during the rule of the Chola king Veera Rajendra. The existence of this image in a nearby village, the reported existence of images of this kind in several villages in the neighbourhood, and the late Chola style of this image, all go to show that Buddhism was undoubtedly in a flourishing condition in this area during the Chola times” (1960: 99). The local people offer sacrifice to the village deity Karuppasamy which is in the vicinity of the temple. To avoid the Buddha seeing this offering, the villagers have installed the Buddha statue separately. Alongwith other deities, Buddha is worshipped here. A Buddha statue was found in the Jain temple at Mannargudi during field study in August 1998. In the Chola country Jain temples are found in Thanjavur, Kumbakonam, Deepanakudi and Mannargudi. The Jain temple at Mannargudi has a Buddha statue, in its northern prakara under the shade of a tree. This is in sitting dhyana pose with beautiful workmanship. Like some of the Nagapattinam Buddha bronze images, this statue has one attendant each on either side (1979: 115). Local people worship this Buddha. Even after the impact of the bhakti movement, Buddhism continued to survive in certain areas of Tamil Nadu during Chola period. The statues found in the Chola country attest to this fact. Many Buddha statues found in this area belong to the 9th century A.D. to the 11th century A.D. Without the presence of Buddhist temples or viharas there would not have been so many Buddha images in this area in the vicinity of the temples. In order to protect the Buddha statues the local people have placed them in the nearby non-Buddhist temples. Buddha is worshipped, as any other deity, in many places. This shows the people treat Buddha equal to the deities that they worship. 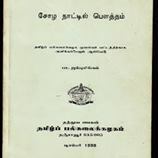 *Published in Tamil Civilization, Vol.19, September 2008, Tamil University, Thanjavur,Tamil Nadu, India. Your research is really incredible. In Tamilnadu, both buddhism and jainism beared the bloody chapters of history. Excellent article Sir, very encouraging for Buddhist enthusiasts like me. kudos to you.